Physical Immortality Discussion On Oprah.com | Let's Live Forever! I recently found a wonderful thread about physical immortality on the Oprah.com discussion pages. Some bits are more wonderful than others, but I REALLY LOVE the introductory piece, written by Dr Janni Lloyd. If you are at all intrigued by the idea of physical immortality, I suggest you check it out… it’s at Do You Choose Life? You may even like to join and have your say! (And the reason for the dolphin pic will become clear if you click through). The discussion has been going since December last year, and at the moment there are over 340 comments. Quite a few writers challenge Janni’s views, and quite a few support it, and others ask questions. Janni is very active in replying to everyone, and she keeps throwing in new thoughts, so the thread almost has a blog feel, I think. One part of Janni’s introduction that resonated with me particularly was where she quoted Sondra Ray‘s words: “all healing is temporary until you heal death”. This thinking is probably the main reason why I chose to make this blog’s main focus physical immortality rather than healing in general… as far as I’m concerned, all the wonderful healing methods out there will ultimately fail if we believe that we will die one day—that something will get us in the end. Something doesn’t have to get us in the end—it only will if we believe it will. Once we free ourselves of this belief we can take up healing techniques with a flourish, knowing we can ultimately be successful! Janni is speaking at the upcoming Conscious Living Expo, which you might like to visit if you happen to be in Western Australia this September 🙂 She’s scheduled to give a talk on the Sunday morning, titled Healthy Radical Life Extension (Explore the Possibility of Physical Immortality, from medical science to Quantum Physics, Alternative Medicine and Spirituality). It’s Jenny Mannion’s birthday today! She is having a surprise online blogging birthday party! Jenny has a great blog: Heal Pain Naturally. Jenny… Here’s a cake, some balloons and a pony! * * *Comments are OPEN for your enjoyment and contribution! Hi Robin: Well, 340 comments shows that there’s a lot of interest in the topic. .-= Marelisa´s last blog ..The Brain That Changes Itself: Good News From the Frontiers of Brain Science =-. Ok…I still have to admit that I am not sure if I really want to live forever. Nonetheless, I have to say that the idea of physical immortality is intriguing. As Marelisa has pointed out, 340 comments is definitely indicative of the interest on this topic. Thanks for the reminder about Jenny’s birthday! I have just sent her a birthday wish! .-= Evelyn Lim´s last blog ..Creation, Intention, Consciousness =-. Yea Robin!!! Thanks so much for the sweet birthday wishes! Thank you Marelisa and Evelyn!!!!! I have had the best birthday celebrations yet and today is for Ray and my kids to spend together. I feel so blessed to know all of you — thanks so much for the well wishes. I have every intention of making my 40’s the best decade yet for me! 30’s were mostly spent sick and then waking up to my potential and health. I enter the 40’s with such optimism and excitement for what is to come and for each and every day. Having friends like you makes my life so much sweeter! .-= Jenny Mannion´s last blog ..Chakra Golf — Chakras for Everyday Lives – Guest Post by Cyndi Dale =-. Having more medical problems than I ever imagined, I have a lot of doubts about living forever. I hope to live forever, whether with a body or without, but clearly have a long way to go in this belief system. Love the mother-and-child dolphin photo. .-= Dot´s last blog ..Comment on Loss by Dot =-. I will have to check this blog out, though I don’t have any real desire to live forever. I am quite happy to pass over and be born again with a new adventure for my spirit to embark on. However, I do like the idea of having good health throughout my life and then dying at a time of my own choosing – when I’m ready. That idea works for me just fine. .-= Kelly@SHE-POWER´s last blog ..Taking a Break =-. Robin, thanks for the link to Janni’s post. I’m thinking maybe I’ve been a believer in the immortality she speaks of, without realizing it. I have for a really long time embraced the “I’m a spiritual being having a human experience” and the immortality of myself as spirit; but I see no conflict with the concept of the body being immortal as a “light body” ~~ in fact, I think it’s an awesome concept and I very playfully want it to be true. Guess I’ll just make it that way, LOL! That’s what I’m looking for, how nice to know I’m not alone here! .-= Betsy Wuebker´s last blog ..A MEAL COULD CHANGE YOUR LIFE =-. The whole idea of physical immortality is a difficult one for me to get a grasp of. So, I’ll check it out and read up on some of the opposing viewpoints. Thanks for the pointer! Happy Birthday!!! Here’s to making this next decade the best ever for you!! I just read Janni’s article. I like it. My understanding is, this is what I call “lightbody” because, if you are freely traveling through the higher dimensions, your “physical” body is not the same physical body we typically have. So we don’t die. We just develop lightbody out of our physical body. I have the feeling, however, that, once I develop my lightbody, I may not come back to the 3D world so often. Not that I don’t like this world, but exploring higher dimensions seem more fun. .-= Akemi – Yes to Me´s last blog ..Progress Report: Lightworker’s Guide To Self-Employment =-. “all healing is temporary until you heal death”. Interesting quote. Reminds me of the state of mind that says “why bother with anything, we are going to die eventually anyway.” It is indeed an interesting philosophical question – why bother improve your life and achieve your goal if death awaits you at the end. .-= Vered – Blogger for Hire´s last blog ..Back To School =-. I will pop over and check out the referrals. I had heard about the Oprah post, but had not visited – no time like the present. I am working on healing myself right now and starting a new regime on Monday the 24th – I am having a prep. week to get my attitude off vacation and back to the present! And my 60th birthday is the 23rd…so Happy Birthday to Jenny! That was a great picture for Jenny’s birthday! I always wanted a pony when I was growing up! Thanks for participating! It was a lot of fun! 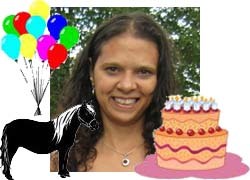 .-= Amy Jewell / Cirklagirl´s last blog ..Happy 40th Birthday, Jenny!! =-. @Marelisa – I wouldn’t necessarily say a LOT of interest – but I think it’s great to see people talking about it. @Evelyn – Hi there – the words Janni quoted “Death is the dingy back door entrance to the heavenly realms” came to mind when I read your comment. @Jenny – Thanks to you for the love you share around, Jenny. I love the way you want to share the excitement you feel about healing yourself of very serious ailments with others, so they might be inspired to do the same. @Dot – You know I fiddled with that dolphin image quite a bit and didn’t notice the baby! (I just couldn’t quite work out the shape). The way I see it, we already live forever spiritually – it would be nice to get the body along for the ride. @Kelly – Hi there Kelly – having good health and choice about how long our life is sound fine to me! @Jeanne – I love the way you say “and I very playfully want it to be true”. Because that is how I see it – it is a playful concept and we don’t need to be bogged down with “serious” spiritual ponderings. I LOVE your poem! (another good one) – and I think the Star Trek guys might have known something! @Betsy – Ha – love it! An elderly relative of mine rang up the people who are our equivalent of home hospice care and told them not to come any more. @Lance – maybe Jeanne’s (above) idea that this is a playful concept is the way to go, Lance. I mean, you surely don’t think about dying anyway, do you? The physical immortality mindset just means feeling like a young person who has their whole life before them, right now. @Akemi – “So we don’t die. We just develop lightbody out of our physical body.” – that is my thinking exactly – i.e. we don’t need to go through the death process to evolve – or, evolving is a result of overcoming death. I’d just be a little cautious if we find ourselves thinking “something else” is more fun than where we are right now – to ascend we need to master the physical realm, rather than escape it, I think. @Vered – Mike Foster, who comments on this blog, recently discussed in a post “My teenaged friend offers up a good point: Why, indeed, should we exercise, maintain a healthy weight, eschew excess, when we are all stamped with a termination date?” He offers some advice to the teenage boy – it is a common underlying attitude, I think. Mike’s post is: Is Life Worth Living? @Patricia – I thought you were having your birthday while still in Scotland – it’s only a few days away now! I think it is GREAT the way you are going for life! @Amy – thanks Amy – I wanted a pony, too. i thought the ideal of immortality is only found in India and countries that believe on resurrection. Now i found some people still enjoy this discussion. .-= Lance´s last blog ..Boracay Regency Resort =-. I did read the Janni article. Thinking that I don’t have enough time for all I wish to do, or that my life will be shortened because both of my parents ‘ lives were dure to disease, are both self-defeating beliefs for sure. I want this life to be long, because I want to see the people my grandkids will become. I do believe in astral travel n am very spiritual. Who wouldn’t want to live forever as scriptures promise? Believing we don’t die, is difficult when we watch so many around us go. Good concept of hope, but difficult to unteach! .-= SnaggleTooth´s last blog ..Need to Dream =-. sure man can have immortality, true, but no man or person can do this or make it happen. This is an intriguing subject, thanks for sharing your find. .-= Mark´s last blog ..Sometimes It Is Difficult to Awaken and Stay Awake =-. I understand we evolve by mastering this world first. At the same time, I think it’s a pretty common sentiment among starseeds that we are so “done” with this world. Not that we don’t like it here or we think “there” is better. By analogy, even when you love the food, you don’t keep eating on and on. You stop at some point and move on to something else that you also enjoy. With life, we haven’t had the same kind of choice. I think developing lightbody is about conscious transition from this world to another (and possibly back). Also, I suspect if everyone can see lightbodies. So those who can’t might think people disappeared. I’ll have to check out the Oprah thread! .-= Mama Zen´s last blog ..It’s Gotta Be THE Shoes =-. Thanks Robin for your cool comments about my Oprah ‘Do you choose life?’ thread- it is creating a lot of interest – it has now received over 23,000 views. Physical Immortality is an ‘idea whose time has come’! @Lance – Hi there Lance and welcome to this blog! I think there is interest in all parts of the world! @SnaggleTooth – hi there again, ST – maybe it will become easier when more and more people embrace it? @Natural – hi Val – if we believe it is possible, might we be more likely to find the evidence? Just a thought. @Mark – yes, I think so. @Mama Zen – I’m glad you write short comments, MZ. @Janni – Ha! Janni! Glad you liked it! I think you are doing a great job over there on Oprah.com, and I am so glad to have met you (in an online sort of way). For me I am not sure I would want to live forever. So, this is an interesting topic. Happy Birthday to Jenny. .-= Giovanna Garcia´s last blog ..Your time is NOW. =-. If I live forever does that mean I’ll have to work forever?!? .-= Tess The Bold Life´s last blog ..Mondays are 1/7 of Your Life =-. Speaking personally, I found that my desire for personal immortality came from fear and mistrust around death. Over the years I’ve come to increasingly experience my connection to all things – how integral my own nature is to all being or nature, how completely I am part and parcel to the whole process – and the idea of personal immortality gradually stopped being a concern to me. Hi there Paul Maurice – I guess that for me, feeling connection and being alive and aware in the present are the most important things, and that seeing ourselves as immortal aids in that. Robin, I haven’t checked out the Oprah series yet, but really liked the exchange here between you and Akemi, as it addressed some of my own questions. I don’t think in terms of physical immortality in terms of extending the life of this current body, I think of it more in terms of reaching a point where this body and this world, or the option of a physical body at all, is just one choice. I think that is the way it is anyway, but our awareness is often too limited to see that. So I don’t know if I think of it as transcending the physical body, exactly. .-= Lisa (mommymystic)´s last blog ..Using Death as an Adviser =-. .-= Ivan Campuzano´s last blog ..The Power of Opening Up =-. @Janni – hi again Janni – I especially like your “the more we open our hearts to each other, embrace our differences and, in so doing, love all aspects of ourself, the more aliveness our physical body has.” Thanks for the contribution! @Lisa – yes I think it is a choice, too. I think we are immortal beings who consist of body, mind and soul – and we need all three to be complete (even if a body can be raised in vibration so it becomes invisible to us, it is still a body of energy). I also think we can connect very well with what is eternal and immortal while alive in a body – “Death is the dingy back door entrance to the heavenly realms” (Annalee Skarin). Robin, I can see that… Could open the door to a long comment or even ideas for a post and with too little time I’ll just say that your words to me point to the spiritual importance of hope. I’ll take a pony too, please! Just kidding. Ponies hate me. Western Australia this September… I wish! I must say with a name like Janni she’s already a shoe-in for a winner in my books. And today I feel immortal. I like the word immortal because it rhymes with portal and portal is one of my favorite words. I also like the words avast, ahoy and yar. And Matey. .-= Jannie Funster´s last blog ..Post-Vacation Contemplation =-. @Paul – that’s lovely – our spirits are naturally expansive, aren’t they? Ahoy Jannie – A pony is on the way (actually, I don’t know whether my manifestation skills are up to that, tho you should have room for one there in Texas). I DO have to watch out when I write your names down! (my 2 Jannies/Jannis).